On this site you can learn all the best hip exercises for women and men. This page has pictures of an inner thigh exercise that also works on balance and hip stability. Many people work the inner thigh muscles while sitting down on a machine. However, when you're sitting on an inner thigh machine you don't challenge your core muscles, hip stabilizers, or balance. 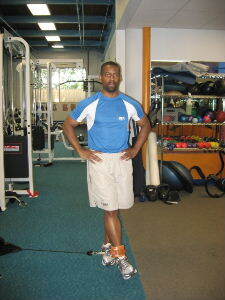 Balance exercises are great for strengthening the hips and stabilizing the knee joint. Below is a great hip exercise for the inner thigh using a cable machine, and as an added benefit the hip stabilizers on the standing leg are also strengthened at the same time. Stand far enough away from the cable machine so that there is a little bit of tension on your inner thigh muscles. Place your hands on your hips and balance on one leg. Form: While keeping your knee straight, move your hip across your body. Hold for a brief second and then return to the starting position. Personal Trainer Tips: If you have difficulty keeping your balance, you can begin by holding on slightly to the sides of the machine, but try to build up to balancing on your own. 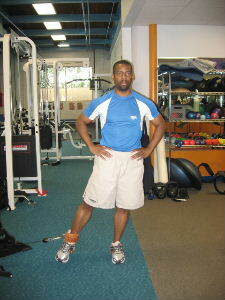 You can also do hip extension (backwards), hip abduction (out to the side), and hip flexion (forwards).